This is what we got from our gardening efforts this year. 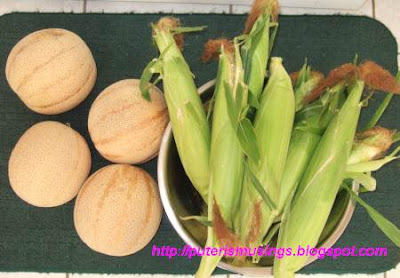 We harvested 7 cantaloupes, and some corn ears. There are still some corn ears on the corn plants because they didn't seem to have grown at the same time. The cantaloupes were juicy and quite sweet. We sliced them up and refrigerated them. The cantaloupe tastes sweeter eaten cold. The water melons are not ready yet. The pumpkins are turning really orange, and we still don't know when exactly to harvest them! Probably they are already over ripe and only good for making Jack O Lanterns.